In May, each of the classes visits the Experiment Station and learns about the research done there. The students observe how well their plants grew in the greenhouse. 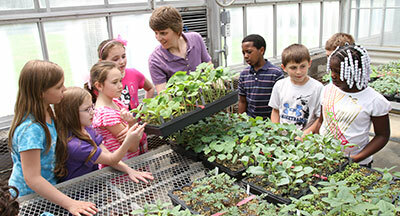 Scientists from Cornell University’s New York State Agricultural Experiment Station have partnered with the Geneva City School District to enhance elementary science education and bring agricultural science to Geneva third and fourth grade students. Kids learn about soil, plants, insects, microbiology, sustainability and food production through an inquiry-based, hands-on program. The program has helped to spark an interest in science, as the 4-H program in the district has expanded and state mandated test scores have improved. The program is split into three sections; Spring Planting, Summer Science, and Fall Harvest. and Cornell University's New York State Agricultural Experiment Station.